Though far from synonymous with the genre, Irish extreme music practitioners have produced their fair share of quality black metal, especially in the past few years. With material ranging from mediocre to magnificent, the latter unfortunately occupying the lower end of the scale, when little gems do appear, they are thoroughly and pleasantly surprising. 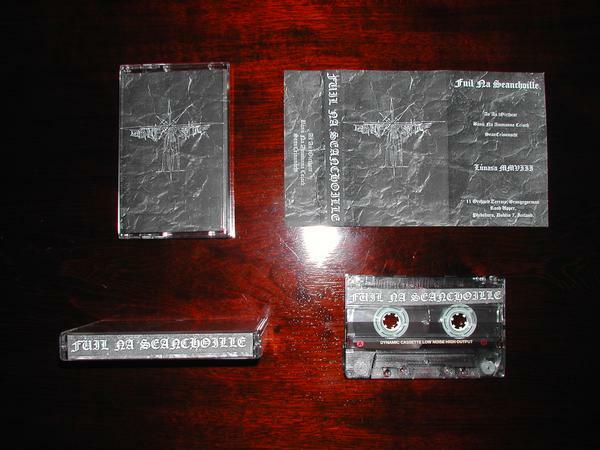 Moody and intentionally mysterious, FUIL NA SEANCHOILLE’s self-titled cassette tape demo floated blissfully under the radar, noticed only by those either too glued to online forums or with a vested interest in Irish-produced black metal. With a hollowed, “blown-out” and endlessly cavernous sound, punctuated by enigmatic choked and barked vocals, FUIL NA SEANCHOILLE have taken a huge step in the right direction: their sound is fresh and interesting from the outset. Hints of melody, mostly toyed-with in the aptly gloomy bass lines, are condensed into changing song structures that never struggle to hold the listener’s attention. Here, also, is found perhaps one of the most suiting and insistent drum sounds to bind a black metal release together to date. FUIL NA SEANCHOILLE demonstrate a great knowledge of black metal’s elemental composition with this all too short demo; its closing track, “Seancríonnacht”, flouts an effortless display of tangible atmosphere in a slower section. Slightly ruining proceedings, however, a synthesised outro adds a strata of tawdriness to what is otherwise solid fare. Shrewdly sidestepping all the facets that usually cheapen black metal with an Irish/Celtic angle or background, FUIL NA SEANCHOILLE deftly explore the darker realms of Irish mythology and history and along with declarations and explanations on music forums concerning their art, have managed to ensure their level of seriousness is understood and appreciated. Originally uploaded under the username 'torchia' to metal-archives.com, 23 June, 2009.